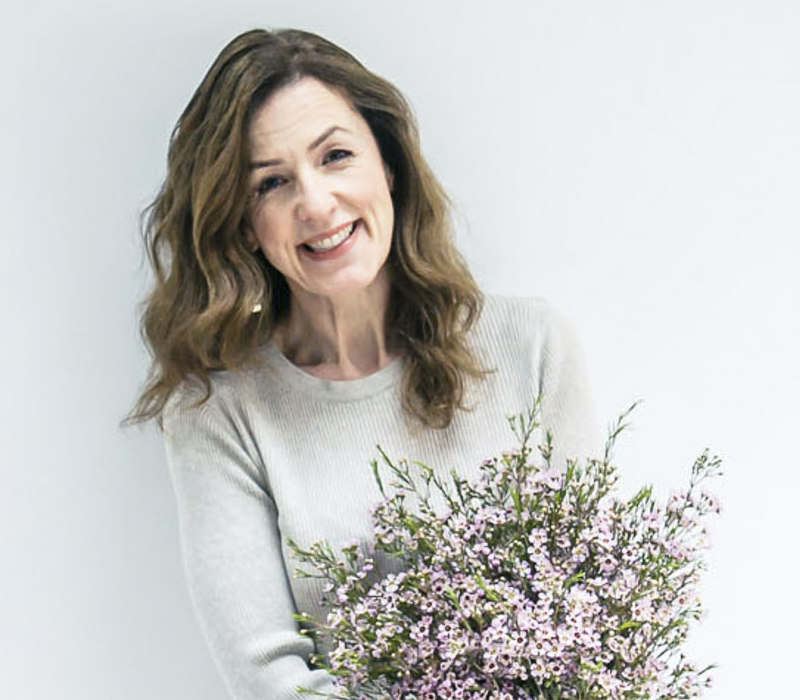 I’m delighted to be featuring today an interview with Kerstin Lambert of The Flower Preservation Studio, together with before and after photos of her work. How did you first become interesting in preserving flowers? I’ve always loved flowers and looking back, a general interest really began as a child when I used to pick flowers and press them. Initially in between the pages of my parents’ heaviest books and then later in my very own flower press that I received one Christmas. However, my real passion for 3D flower preservation only began back in 2005 after I was fortunate to see some flowers that had been preserved in silica gel. I’d never seen this done before and was absolutely amazed that flowers could keep their 3D shape so beautifully, rather than having to be pressed flat. At the time, I’d been medically retired from my job and had plenty of spare time on my hands. So I spent several months experimenting and drying virtually every type of flower I could think of using silica gel. It became a bit of an obsession and there were a few disasters along the way. But every attempt achieved better and better results, and I learnt something new about the process every time. As my results from my experiments improved, so did my confidence and I started to think that perhaps I could do something with this flower preservation knowledge. Having a mother who was an avid scrap booker and card maker, I knew that people loved to keep mementos from special occasions. So the idea of preserving flowers from special occasions seemed a really good idea. I started The Flower Preservation Studio in 2005 with the intention of preserving a few wedding bouquets and other special occasion flowers and turning them into keepsakes. I made some sample pictures and did a few wedding fairs in my local area in order to get my name known. But the intention, at that time, was really only to do a few commissions as a bit of a hobby business. I had no idea at that time that the business would take off as it did or that it would grow and develop in the way that it has. 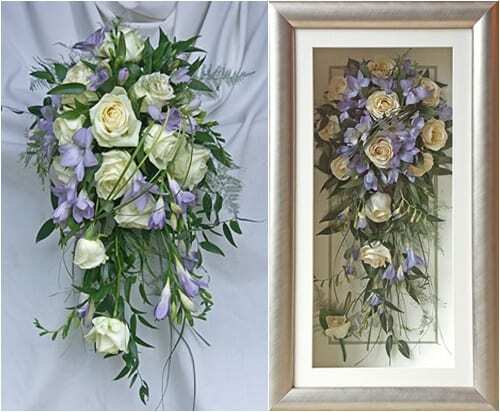 Display options for the flowers range from 3D picture box frames which are designed to hang on a wall like a picture, to beautiful acrylic cases which are freestanding and can be placed anywhere. The Flower Preservation Studio also makes and supplies its own freeze dried confetti from a gorgeous mix of freeze dried flower heads and petals mixed with air dried petals and buds. It is 100% natural, completely biodegradable and comes in a variety of beautiful colours. The Flower Preservation Studio is based in beautiful Wimborne in Dorset. 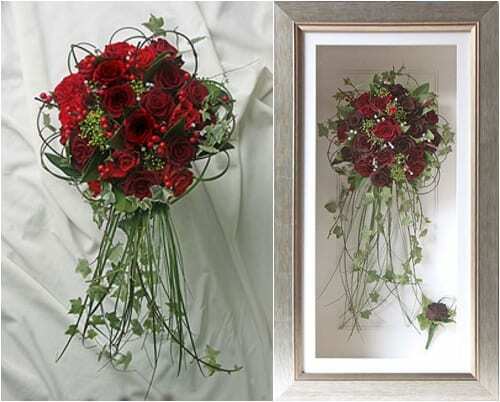 However, we do offer a nationwide service and anybody in the UK can have their flowers preserved by us, if they so wish. How quickly do you need the flowers after an event? We can preserve flowers up to one week old, even longer if they are still fresh. However, we prefer to receive them as soon as possible after an event whilst the flowers are still at their best as the fresher the flower, the better the final result from the preservation process. Could you tell us how you preserve the flowers in 3D? For the first few years, The Flower Preservation Studio used silica gel to preserve our client’s flowers and wedding bouquets. Whilst silica gel produced wonderful results, I was always very keen to see if results could be improved even more and so I explored the possibility of using freeze dryer technology which was being used a lot by flower preservation companies in the United States at that time. Initially, the cost of the freeze drying machine was off-putting…£20,000+ for a new, small machine is not to be sneezed at. But eventually, we decided to take the plunge and invest and since then, we’ve not looked back. I won’t bore everyone with all of the science of the freeze drying process because it took me a long time to understand myself, but in very basic terms the freeze drying process works by freezing the flowers down to around -50C. Once the flowers are frozen solid, a vacuum is applied to the chamber holding the flowers which reduces the surrounding pressure around the flowers. This then lowers the boiling point of water which allows any frozen water, which is trapped in the flowers and petals, to sublimate directly from a solid phase to the gas phase. In other words, sublimation causes the frozen ice in every part of a flower to slowly leave the flower as vapour, without actually melting and damaging it. It’s the most amazing process and the finished result is a perfectly dried flower that has kept its original 3D shape and form. 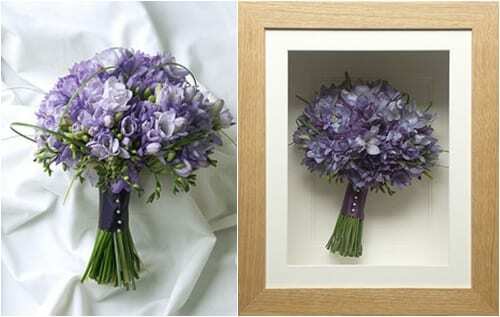 It all depends on how much of your bouquet you would like preserved and displayed. Prices start at £80 and go all of the way up to £400 for a very large, shower type bouquet. 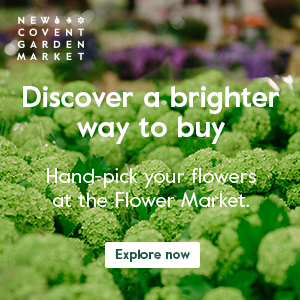 However, what sets us apart from other flower preservation companies is that our prices are fully inclusive and there are no hidden extras to pay. 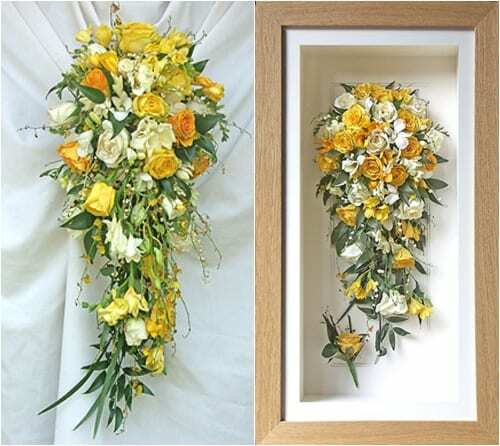 They include courier collection of the flowers from anywhere in the UK, preservation of the flowers, plus bespoke framing and delivery of your finished keepsake. I know preserving flowers is not a cheap thing to have done but considering the amount of time, work and expertise that goes into each of the keepsakes, it does represent very good value for such a quality and bespoke keepsake. 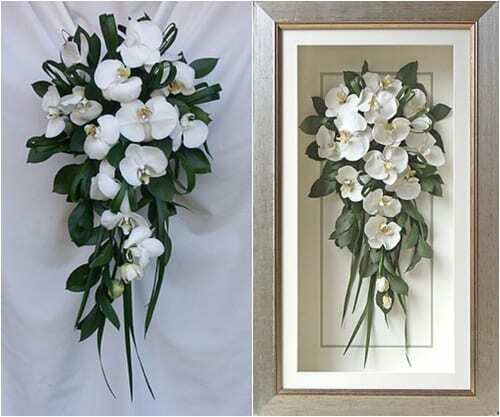 Why are the preserved bouquets presented in frames? Whilst preserved flowers may look beautiful, the reality is that they are extremely fragile and can shatter and break very easily if knocked. Unfortunately, the only way to guarantee that they won’t get damaged is to protect them in some sort of frame or display case. The other reason for protecting the flowers in a frame or display case is because potentially moisture from the atmosphere can be re-absorbed back into the petals, resulting in the flowers not staying as dry as they should. It obviously depends on where the flowers are kept and how humid the conditions are but my personal preference is to protect the flowers as much as possible so that they stay looking beautiful. Framing also protects the flowers from dust and the dangers of people poking the flowers with their fingers. 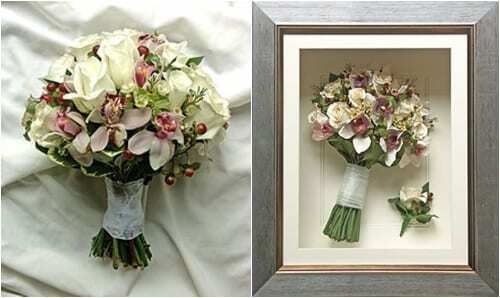 How long does it take to preserve a bouquet and create the keepsake? The demand for our flower preservation service is very high and I always tell clients that it will take around 20 weeks on average for a keepsake to be completed. When the flowers arrive at the studio, photos are taken as a record and an inventory of flowers and foliage is made. 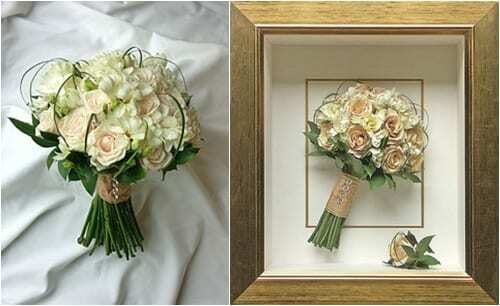 The bouquets are then measured and detailed notes are taken about its construction. The bouquets are then taken apart and placed into a special holding freezer whilst they wait for space to become available in one of our freeze dryers. Once the flowers have been freeze dried, it takes between 20 and 30 actual hours of work on the flowers before they’re ready for mounting and framing. Then, depending on the bouquet, it can take anywhere between 4 and 12 hours to put the bouquet back together. Once the bouquet has been put back together and the flowers have been mounted, a box frame is custom made to fit around the flowers. It takes great patience to complete each of the keepsakes but I personally love it and find it very therapeutic and absorbing. How long will the preserved bouquet last? 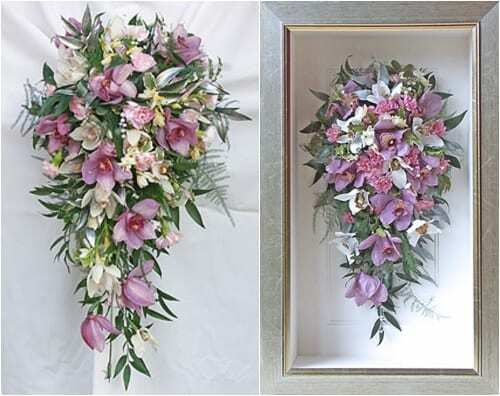 If the pictures are looked after properly, the flowers will last a lifetime as they are protected behind a special conservation glass which has a UV filter which helps to protect the flowers from UV damage. Depending on the colours of the flowers, they may mellow over time but because we religiously paint every single flower and bit of foliage, the change will not be very marked. I love all flowers and my favourites can change from week to week depending on what I am working with at any one time. But if I had to narrow it down to one (or two) then my ultimate favourites would have to be peonies and David Austin roses, both of which preserve beautifully. Many thanks to Kerstin for all her help in putting together today’s blog post. I’m just so impressed at her amazing skillset…not only preserving the flowers but also the way she beautifully arranges the bouquet designs. Kerstin is very proud to be a member of The Guild of Master Craftsmen. If you’d like to keep up-to-date with news from The Flower Preservation Studio, they’re on Facebook and have a blog. Peonies are my favourite too. Some say that using Peonies is playing the safe way but they are gorgeous in their own way! Great post. Keep ém coming! Thank you Bhavya for your comment :-).